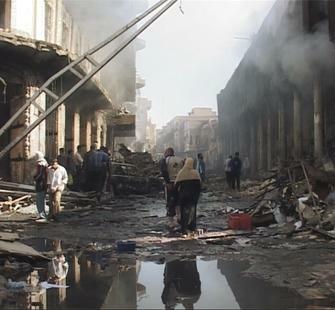 On March 5th, 2007, more than 30 people were killed when a car bomb was exploded on Mutanabbi Street, an old and established street for book-selling in the heart of Baghdad's literary and intellectual community. To protest the bombing, the Mutanabbi Street Coalition, a group started by San Francisco poet and bookseller Beau Beausoleil, invited letterpress printers to produce broadsides, which will be on exhibition at the Saratoga Library March through April, 2008. Paralleling the broadsides exhibit, Montalvo partners with Saratoga High School’s creative writing program to explore Baghdad’s 2007 Mutanabbi Street bombing through poetry and art. After months of research and participation in Montalvo's IRAQ:REFRAME programs, Saratoga High's creative writing students present poetry in response to the Mutanabbi Street bombing. These poems will be displayed in the Saratoga Library student study room concurrently with the Mutanabbi Street exhibit.